I’d say it’s been over a year now since I’ve stepped foot on a golf course or driving range so a couple of days ago me and a friend decided to smash some balls, let the big dog eat so to speak. But my big dog kept coming up… hungry? Contact, yes I can do that, but for some reason I have this super impressive ability of being to hit the ball and it goes directly behind me. Not even sure how I do it, but the poor guy that was trying to work on his swing eventually packed up and moved to a safer location. Plus with golf there is just so much flippin’ stuff to remember. 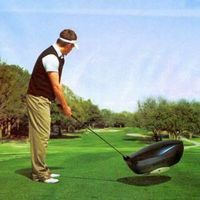 How to hold the club, lining up the ball, keep your head down, keep your arm straight, don’t look up, bend your knees, when all I want to do is hit it and have it go straight, is that so much to ask? Why can’t golf be like cooking? I’m super good at that, I’d like to see Tiger Woods make a gluten free donut that doesn’t taste like cardboard. So you can hit a ball really far and really straight, pffffft. I’ll be over here eating my donut. In a small pan with just a little bit of water bring that up to a boil and once bubbling toss in your broccoli and throw a lid on it. This will only take about 4-5 minutes to cook, and for all you vegetable killers out there, there is no need to cook broccoli until it’s mushy, that’s just grossy. If you’re using frozen peas toss them in for the last minute or so to cook the chill off. Once your veg are cooked and I said cooked not mushy, set aside and in the same pan heat up some avocado oil and place your salmon in the pan skin side down (a little salt on pepper on the fish first, maybe even a squeeze of fresh lemon) and cover for about 3 minutes. After 3 minutes flip and cook for another 2 minutes then turn off the burner and let the fish rest for another minute or two in the pan, leave it covered. You’ll know your salmon is done if you can flake apart the thickest part of the filet. 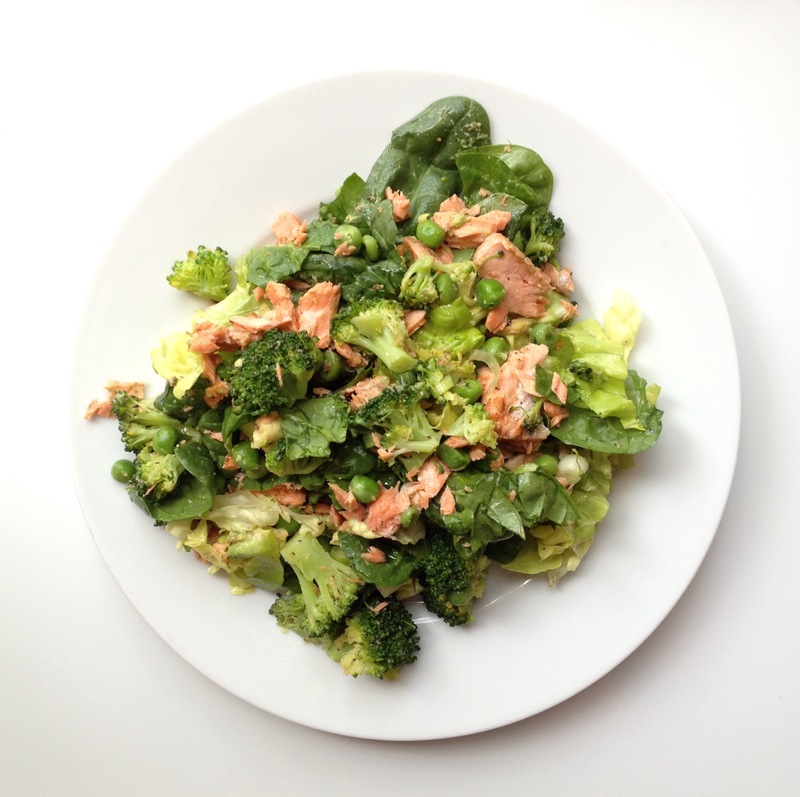 For those of you that follow me (hi and I hope you exist) you’ll remember this easy method of cooking salmon from my Beet Broccoli and Salmon post https://cowcrumbs.com/2015/03/15/roasted-beets-with-salmon-broccoli-avocado/ for all you new comers (hi) I swear this is the easiest and best way to cook salmon and it turns out perfect every time. 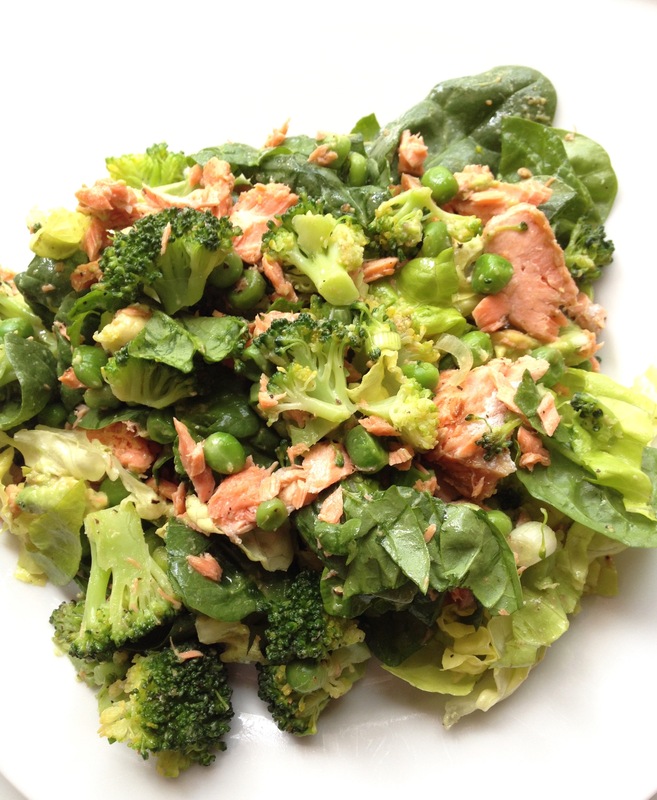 So now that your veg are done and your salmon is perfect, toss together with a big handful of spinach and boston lettuce, drizzle on some avocado oil and apple cider vinegar, and enjoy. Better than a hole in one I swear.